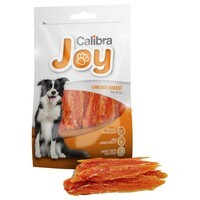 Calibra Joy Chicken Breasts are tasty and easily digestible treats made using dried Chicken Breasts to provide the perfect delicacy for your dog to enjoy. Naturally low in fat and high in protein, the treats are a perfectly healthy snack for your dog to enjoy between meals or as a reward for training. Your dog will love sinking their teeth into the juiciness and chewy texture the treats offer.